Today, we’re thrilled to announce the release of MongoBooster 2.0. This major release includes fluent query builder, GUI for mongotop and mongostat, dark theme, user-defined snippets, restore last working state , auto-update and a few minor improvements. 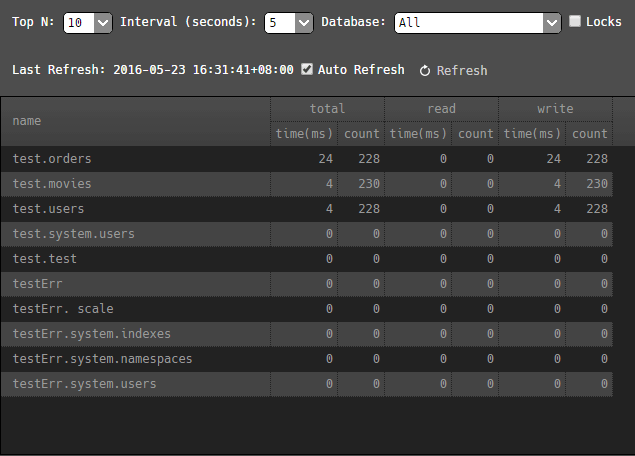 Even better now, MongoBooster, the smartest and most feature rich MongoDB Admin GUI is free for non-commercial use. MongoBooster supports mongoose-like fluent query builder API which enables you to build up a query using chaining syntax, rather than specifying a JSON object. The aggregation framework is now fluent as well. You can use it as currently documented or via the chainable methods. For MongoDB, mongotop do pretty much the same job as the Unix command top, it is used to monitor the Mongo instance.The output of mongotop indicates the amount of time the mongod process spend reading and writing to a specific collection during the update interval. mongotop provides statistics on a per-collection level. MongoBooster offers a build-in GUI tool for MongoTop. No external MongoTop command line tools dependence and works for MongoDB 2.2-3.2. 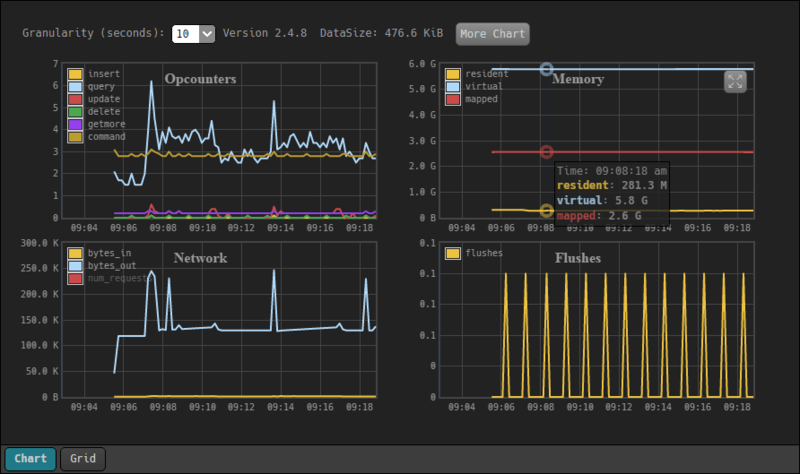 The mongostat utility provides a quick overview of the status of a currently running mongod or mongos instance. mongostat is functionally similar to the UNIX/Linux file system utility vmstat, but provides data regarding mongod and mongos instances. MongoBooster offers a build-in GUI tool for MongoStat too. No external MongoStat command line tools dependence. MongoBooster V2 offers two themes, light and dark. 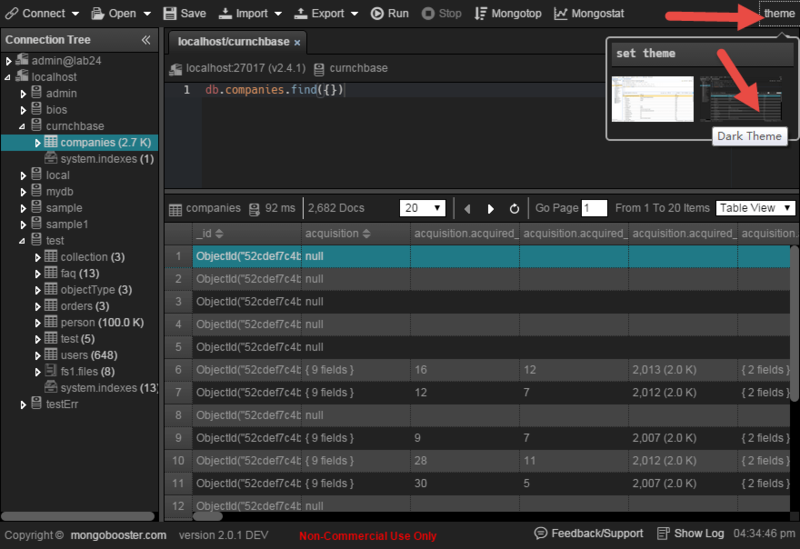 The Dark theme provides a high-contrast visual theme (black background with brighter text). You can switch the theme by click “theme” button in the right corner of the main toolbar. Having a collection of pre-defined code snippets is handy, but code snippets become much more useful when you make your own. 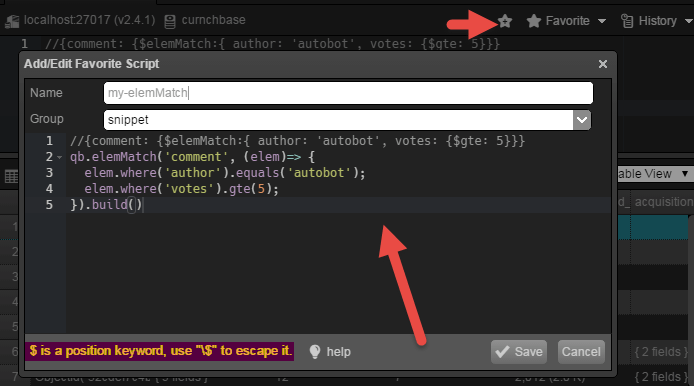 Now, you can add your self-defined code snippets by clicking “add favorite script…” button in the editor toolbar. MongoBooster add a new option to remember the last working state, so when you restarted MongoBooster all of your last working connection, database , collection, editor script got restored to last working view. Use Menu->Options->Restore last working state to toggle the feature. When add new ssh connection, MongoBooster will recognize SSH config file and auto fill SSH connection fields from ssh config file. The auto-updates feature enable MonoBooster to automatically update itself, so your copy will always be up-to-date. The auto-updates module is based on Squirrel framework. Note: For Mac and Windows users, we have enabled the auto-update channel. Auto-updates are not supported for Linux.